A few weeks ago, we had dinner at Sevruga on V & A Waterfront. It really is one of my favourite spots for a celebratory dinner. The atmosphere is intimate, yet bustling at the same time. And the food? Never disappoints :-D They have a winter special, which is great value for money as you pay a set price for a few choices of starters, main and dessert. 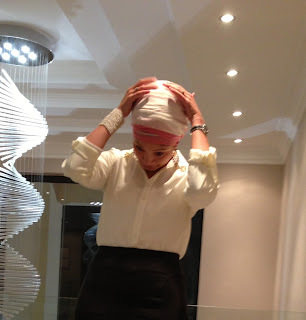 It was a special occasion, so I decided to dress up and try out the turban for an evening out. It's becoming easier with practiceThe weather was pretty chilly and I chose a pair of tights to cover up. with my Perry Book wedges. Always checking that the doek is still in place! Thats a lovely look..like the colors of your head piece a lot! Thanks Desle! Their sushi is lovely... but so is all the dishes I've had there!